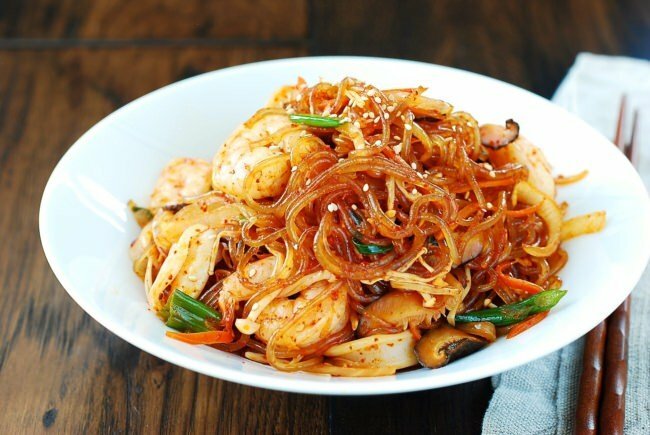 This recipe is another variation of japchae (잡채)! 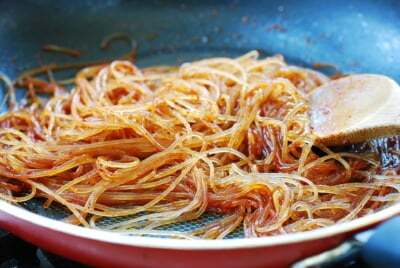 I previously posted kongnamul japchae which is a variation made with soybean sprouts. 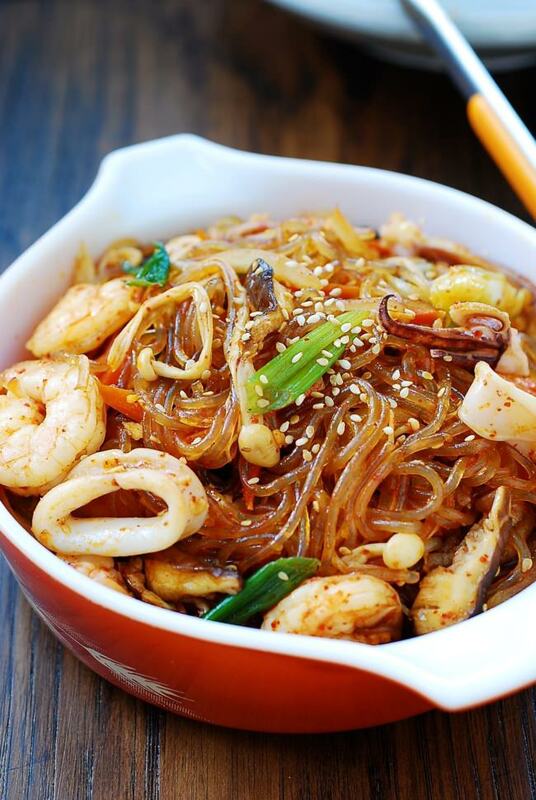 This time, the japchae is made spicy with seafood! 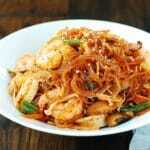 I got the idea from the spicy seafood japchae my son and I enjoyed at a Korean restaurant in NYC’s Koreatown. It had a nice and clean spicy kick which was prominent enough to wake up our palates but not overpowering. It also had a generous amount of seafood. 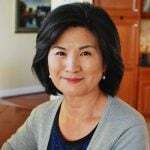 We thought it was a nice change from traditional japchae. 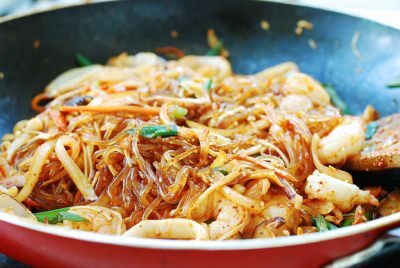 If you’re not a fan of seafood, this recipe can easily be turned into a vegan japchae by omitting the seafood. Likewise, if you don’t like spicy food, simply omit the gochugaru (Korean red chili pepper flakes) for a mild seafood japchae. 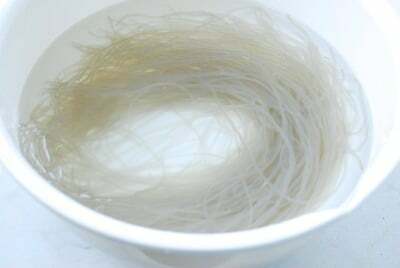 The main ingredient, of course, is sweet potato starch noodles called dangmyeon (당면), also known as glass noodles. 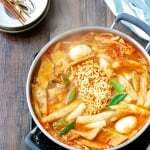 The most common way to cook the noodles for japchae is to boil in water for a few minutes. Here, I soaked the noodles until soft, and then stir-fried in oil infused with gochugaru (Korean red chili pepper flakes). This method yields a bit chewier and bouncier noodles. If you like softer noodles, you can boil them first before stir-frying. 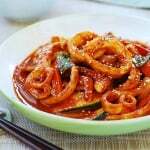 For the seafood part of the dish, I used a small, tender squid (known as calamari in America), and small shrimp. The restaurant version also had small octopus (nakji, 낙지). You can simply use shrimp if you’d like. The vegetables I used in this recipe are pretty basic — onion, carrot, mushrooms, and scallion. Use any mushrooms you have or like. If you have leftover spinach, cucumber, zucchini or bell pepper in the fridge, any of them would be great in this recipe. You don’t need much for this recipe. 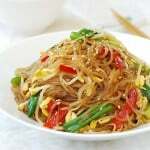 How is japchae served in Korean cuisine? 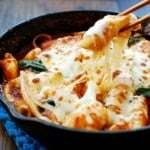 It’s most commonly served as a side dish (banchan), but it’s also enjoyed as an appetizer, or over a bed of rice as a main dish. 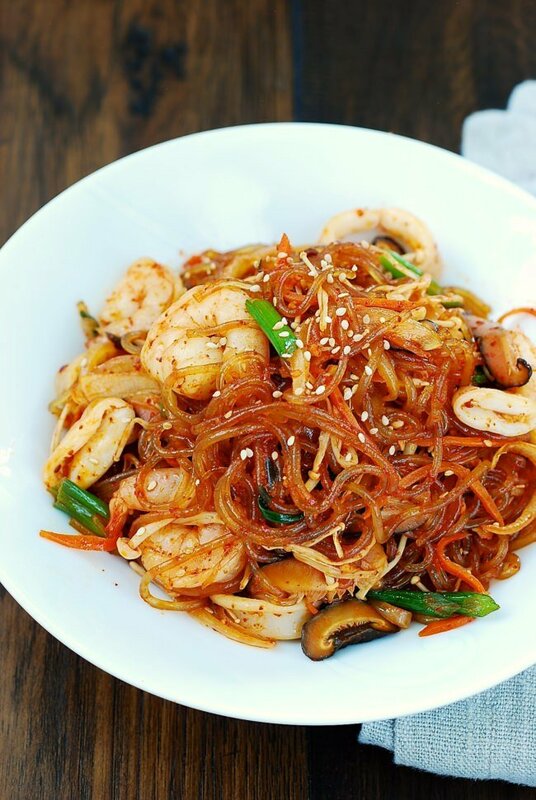 Korean sweet potato starch noodles made with seafood and a spicy kick! 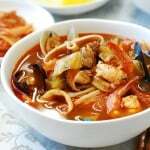 Soak the noodles in warm water until soft (about 30 to 40 minutes), and drain. Clean the shrimp and squid. Cut the squid into bite size pieces. Prepare the vegetables, and mix all the sauce ingredients in a small bowl. 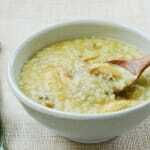 Add the vegetable oil, sesame oil, and the gochugaru to a pan, and heat until hot over medium low heat, stirring. 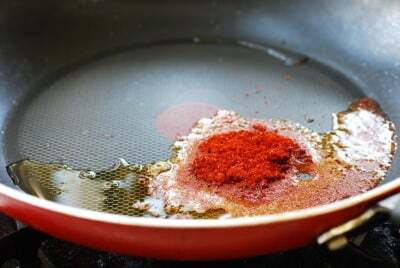 Remove from the heat as soon as the oil starts to turn red and the chili pepper flakes become a bit pasty. Do not burn the gochugaru. Turn the heat to medium, and add the noodles to the pan along with 1-1/2 tablespoons of the prepared sauce. Stir-fry until the noodles are soft, 3 to 4 minutes. 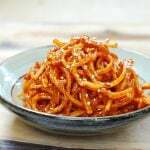 Remove the noodles onto a plate. 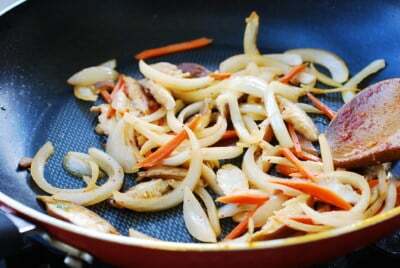 In the same pan, stir fry the onion for a minute, and then carrot and mushrooms until wilted. Add a tablespoon of water if the vegetables look dry. Lightly season with salt and pepper. 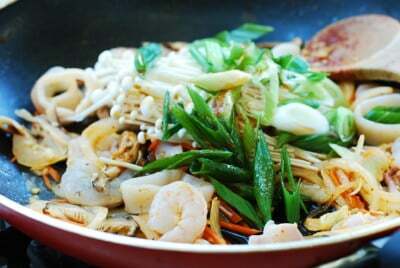 Add the seafood and the remaining sauce, and stir-fry until the seafood is cooked through. 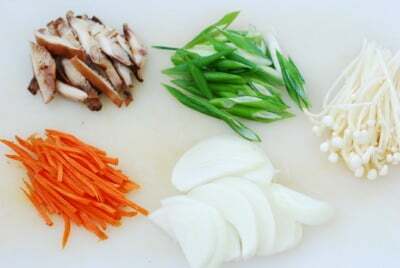 Follow this by the scallion and optional enoki mushrooms until the scallions are slightly wilted. Return the noodles to the pan, and toss everything well together. You can add a bit more sugar and/or soy sauce to taste. You can grind your regular gochugaru in a spice grinder. I used 1 tablespoon gochugaru for the first photo, and 1/2 tablespoon for the second photo. Awesome! Thank you so much for trying the recipe and for the great review!